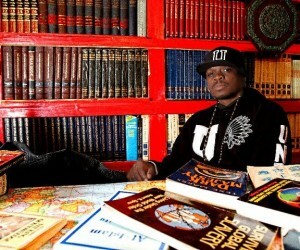 Wise Intelligent is an internationally known artist/activist, songwriter/producer and the front man of the critically acclaimed and Legendary Hiphop trio known to the world as the Poor Righteous Teachers. PRT hail from and represent Trenton New Jersey. They released five incredible albums throughout their illustrious career. Throughout his career Wise Intelligent has collaborated and performed with world renowned artist like: Lauryn Hill, Wyclef Jean, The Fugees, Mos Def, Public Enemy, KRS ONE, Ice Cube, Too Short, X Clan, Junior Reed, Ms. Jones, and many others. Their groundbreaking certified gold first album – Holy Intellect – was released on Profile records in 1990 and introduced the world to one of the most unique and revolutionary sounds in Hip Hop history. Their equally impressive follow up album Pure Poverty was released in 1991 and cemented their place as one of Hip Hop’s most elite groups. Black Business (1993/Profile), Killing U for Fun (1995 Slangspit/Contract), New World Order (1996/Profile), and Declaration Of Independence (2001/Exit 7a Records) continued to build on PRT’s standard of lyrical excellence and commitment to raising the consciousness of poor people worldwide. Between 1989 and 1996 the group’s albums sold a collective 2 million records. Wise Intelligent has performed on several national and international tours covering all of the United States and Canada, London, Germany; Auschwitz, Fribourg, Switzerland; Zurich, Holland; Amsterdam, France, etc. Throughout all of Wise’s work, he has espoused the virtues of community service and activism as embodied in the struggle of poor people around the world. Growing up in any ghetto in any country around the world is not an easy task. Urban decay, joblessness, homelessness, racism, drugs and death are just a few of the things that await the children of the world, and Wise has always stood on the front lines of that struggle. In 2007, Wise Intelligent reveal his entrepreneurial fortitude launching his Intelligent Muzik Group, LLC; an independent record company that records markets and promotes progressive Hip Hop content. Immediately following the companies first release “The Talented Timothy Taylor.” The album developed the necessary audience for the much awaited release of Wise Intelligent’s “The UnConkable Djezuz Djonez scheduled for a December 2010 release.